This is another of Mum’s ideas where a vague notion (and no recipe at all) evolves into a very tasty meal (hence the name of the recipe). For the filling, we roasted vegetables, but this would even quicker and economical to make if you have any left over roasted vegetables in the fridge. Cut 20 thin slices of pumpkin (about 5mm thick). Dry with a paper towel. Line a large baking dish (or tray) with tin foil. Spray tin foil with oil, place pumpkin slices in dish, and spray pumpkin with oil. Bake at 200 degrees Celsius for 25 minutes. Turn them after 10 minutes and add a sprinkle of salt and pepper. Chop the onion, mushrooms, capsicum, and garlic. Place all in a dish with oil and cook in the oven for 35 minutes (the pumpkin is already in the oven, so place it alongside) – OR fry these ingredients in the fry-pan. Brown pine nuts in a fry-pan. 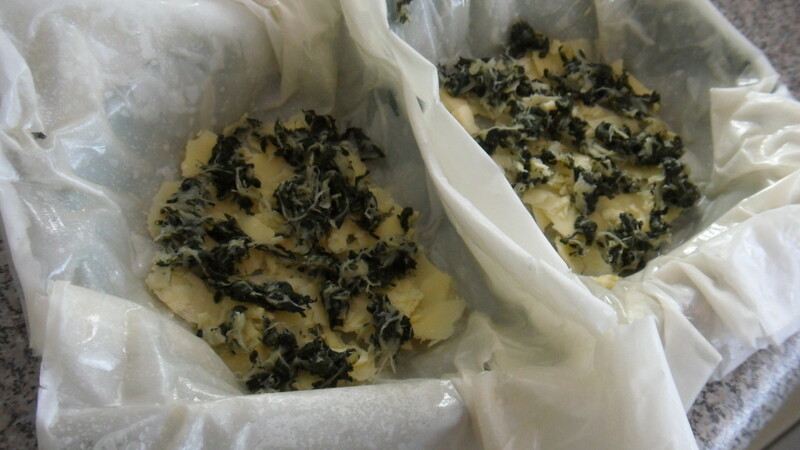 Thaw spinach or silverbeet, and squeeze out as much moisture as you can so it weighs about 40-50g. Shave thin slices of tasty cheese, enough to spread on the bottom of the pies (the cheese seals the base of the pie so the pastry won’t go soggy). Layer on the silverbeet and the roasted pumpkin, (make sure they are cool before layering into the pie, or it will affect the pastry). Next add the roasted vegetable mix, then sprinkle with pine nuts, crumbled feta, and add another layer of pumpkin, and sprinkle with salt and pepper. Tear up the extra piece of filo pastry and cover the top of the pie. 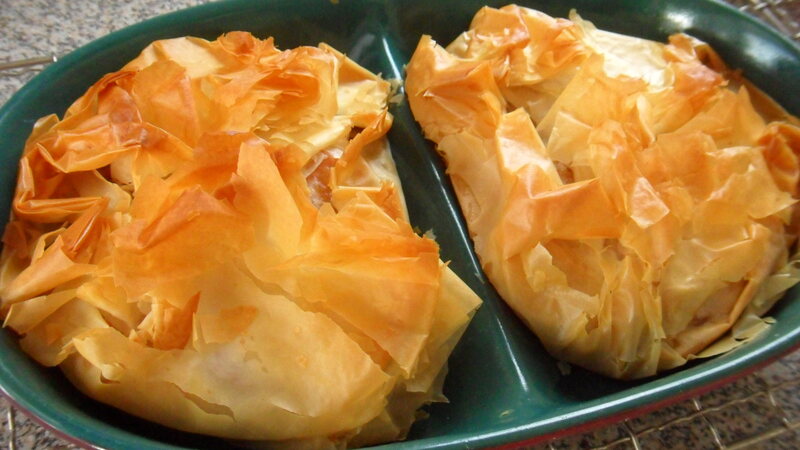 Bring the layers of filo pastry that are hanging over the sides of the pie over the top and scrunch up. Bake at 170 degrees Celsius for 40 minutes. When the filo looks brown enough on the top of the pie, place baking paper over the top to stop it browning any further. For the last 5 minutes of cooking time, place the pie lower down in the oven to make sure the bottom of the pie is cooked and not soggy. When baked, remove from the pie dish and cool on a rack for 5 minutes. 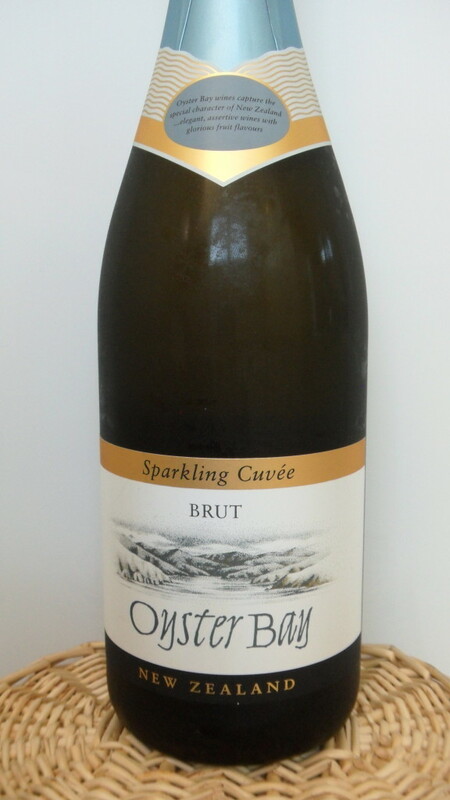 Oyster Bay, Sparking Cuvee, Brut, from Marlborough, New Zealand (which was in keeping with the theme since we used sea salt from the Marlborough region as well).